Splintered Light is known for its fantastic 15mm models, but I recently discovered they have lots of figures that mix very well with 20mm men. The Goblinoids in the "Splintered Lands" range have chunky proportions which make them suitable monsters in a 1/72 scale. I'd say the humans and most of the other creatures in Splintered Lights catalog are too slim and tiny to serve as 1/72, but the Bugbears, Goblins, and Kobolds work great. I got their goblin cavalry on wolves for my growing DBA goblin army. I also noticed that their Kobolds looked to be about the right size too. The owner was nice enough to through in a single sample for me to compare. And they look perfect! 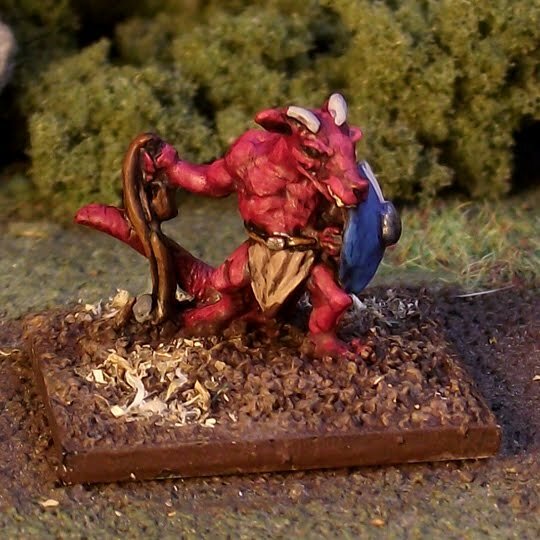 I just might have to do a Kobold army too (or at least paint a few singles for fun). 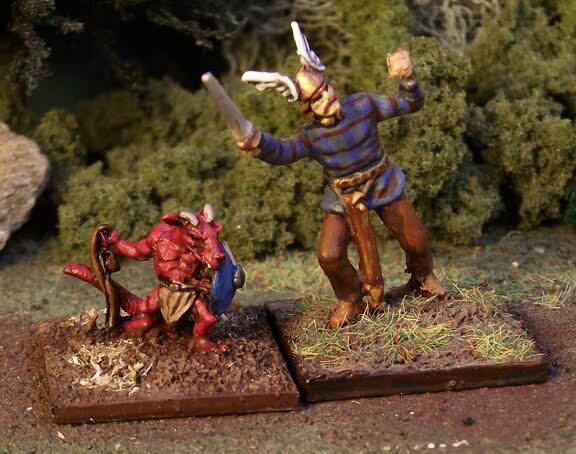 Below you can see the Kobold slinger next to a 1/72 Revel Celt. great painting on such a tiny thing...sorry..Kobold. I've bought the Kobold box from SML and I've been painting them blue. By the way, did you also paint the eyes, or are they just shaded? I don't usually paint etes anymore, but I did paint this kobold's with black.